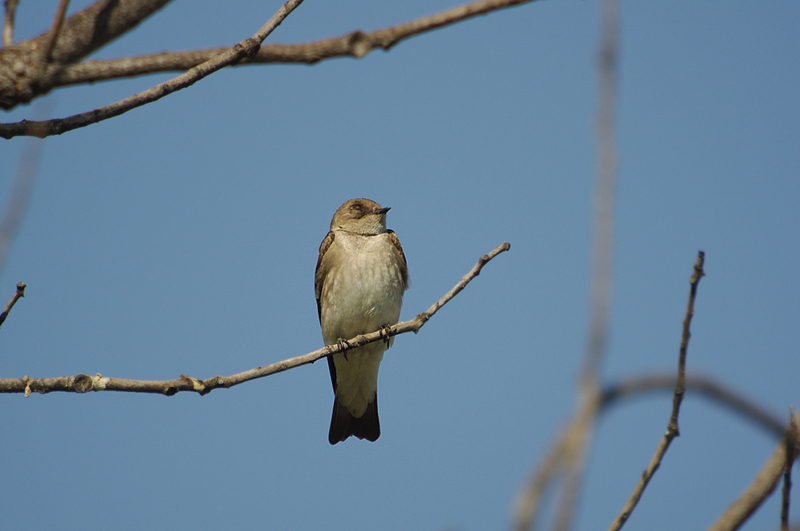 A plain brown bird, the Northern Rough-winged Swallow is fairly common across the United States in summer. 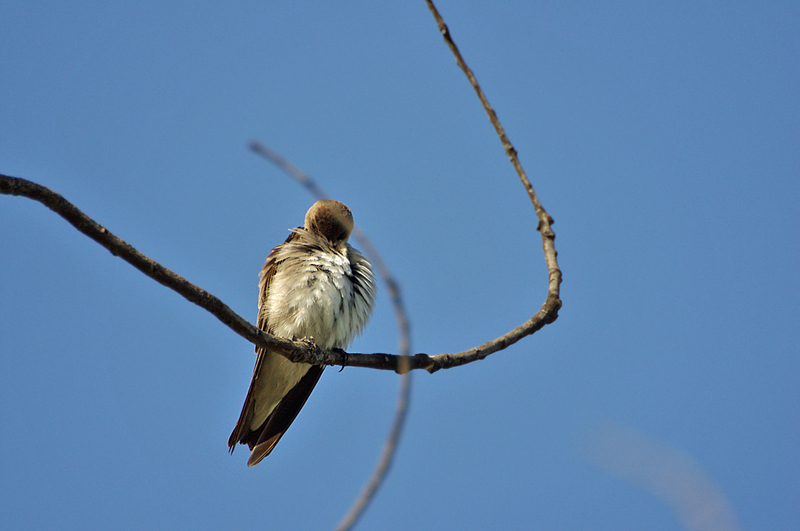 The species derives its name from the outer wing feathers, which have small hooks or points on their leading edges. 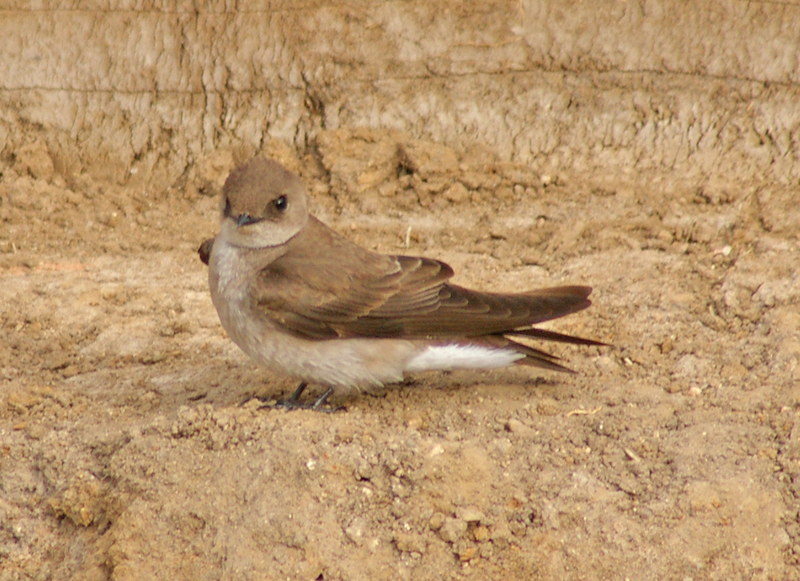 The Greek genus name of the Northern Rough-winged Swallow, Stelgidopteryx, means "scraper wing;" the Latin species name, serripennis, means "saw feather." 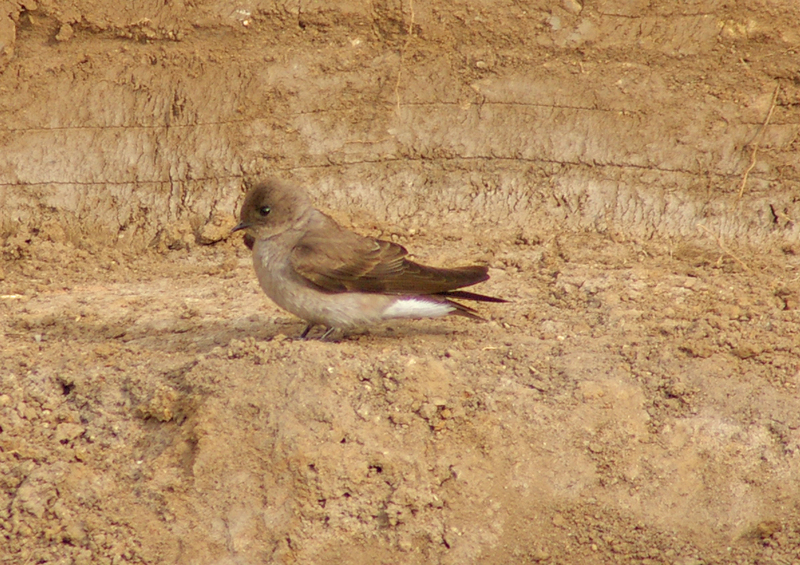 Uniformly dull brown head and upperparts. 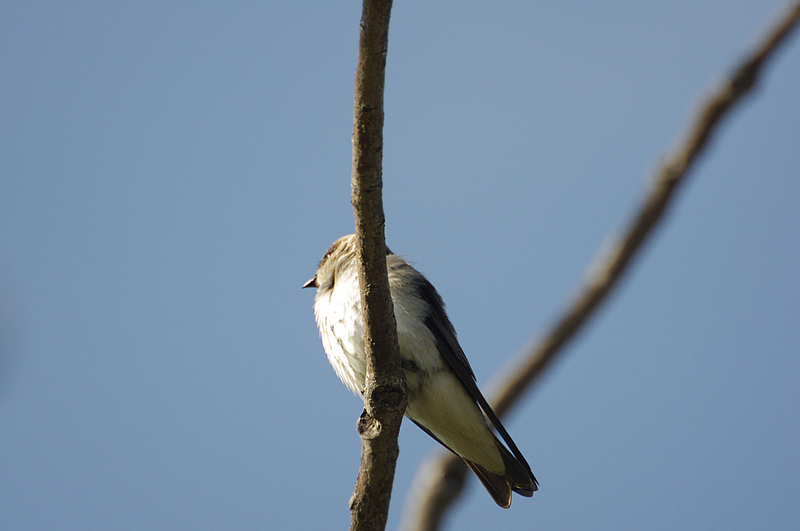 White belly and under tail. 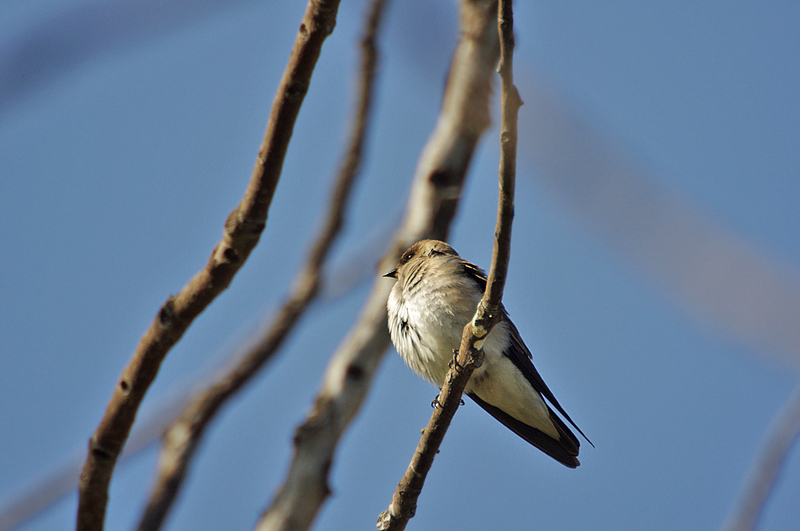 Sexes appear similar; in the hand, male can be identified from more pronounced hooks on the leading edge of the wing feathers. 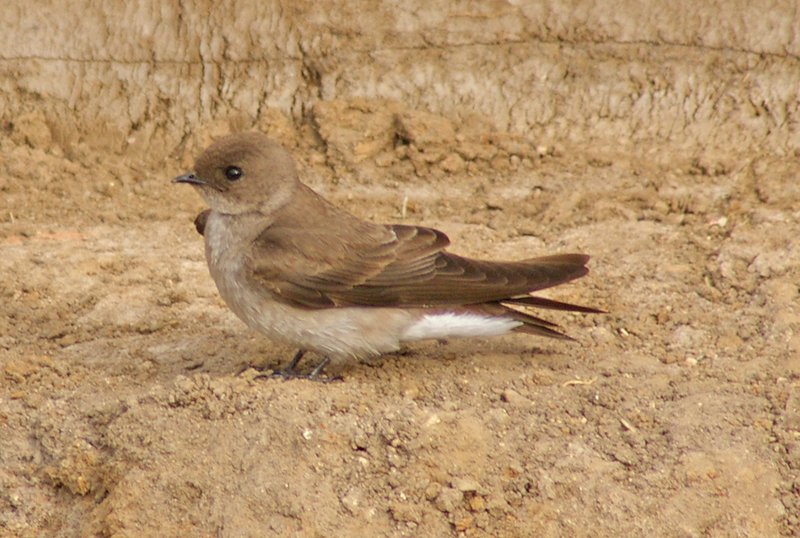 Juvenile similar to adult, but with cinnamon wash on throat and indistinct cinnamon edges on brown feathers of upperparts, most noticeable on wings. 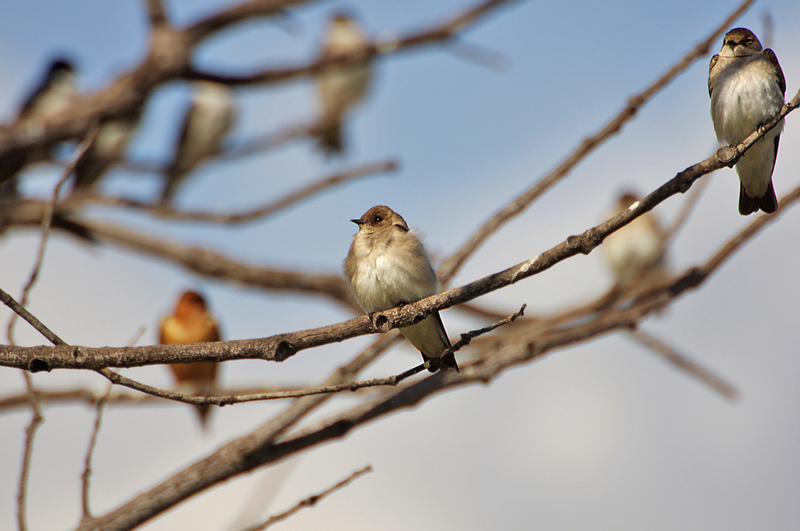 Breeds in a wide variety of open habitats, with openings in various vertical surfaces, including banks, gorges, and human structures. 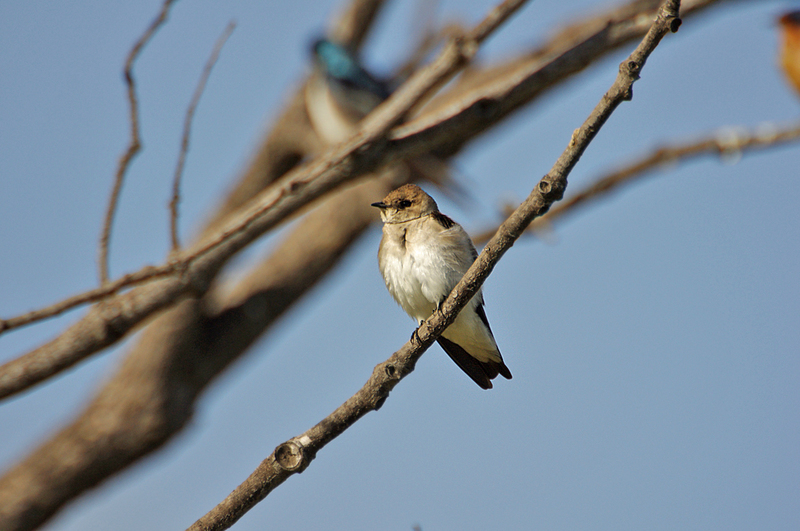 Catches insects in flight, often close to ground or water surface. 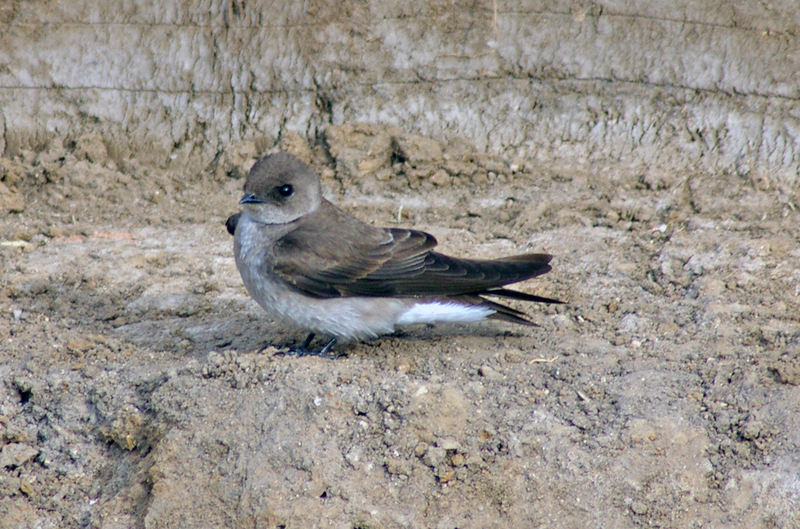 Bank Swallow is smaller and has a distinct dark brown breastband separating a clean white throat and white lower breast. 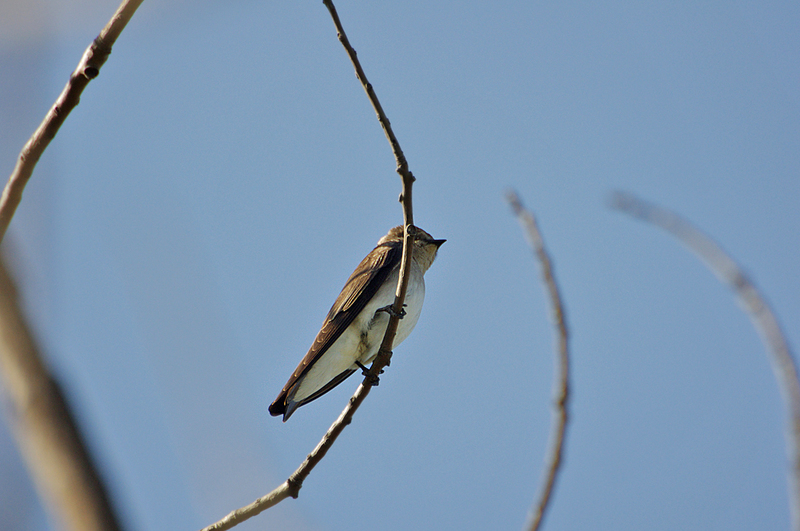 Juvenile Tree Swallow has brownish back and a dull chest, but it has a faint band across chest and a whitish throat. 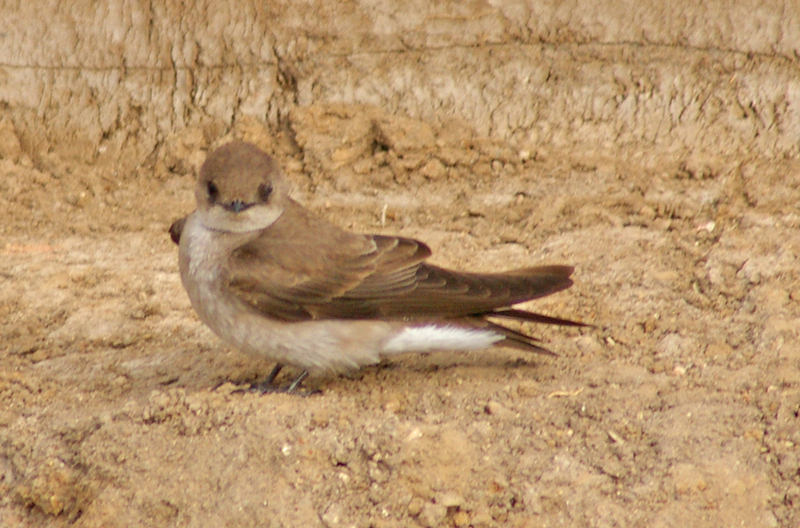 Territorial male gives a series of short, relatively low-pitched, rising "brrt" or "jrrr" notes. 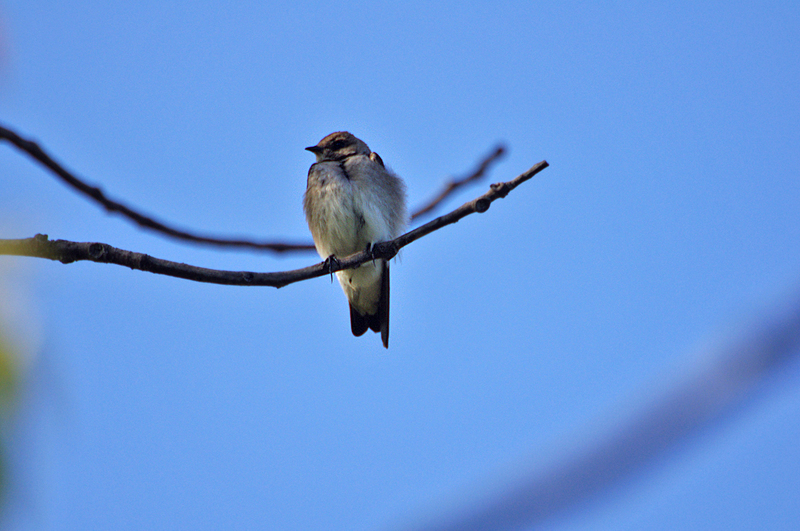 DeJong, M. J. 1996. 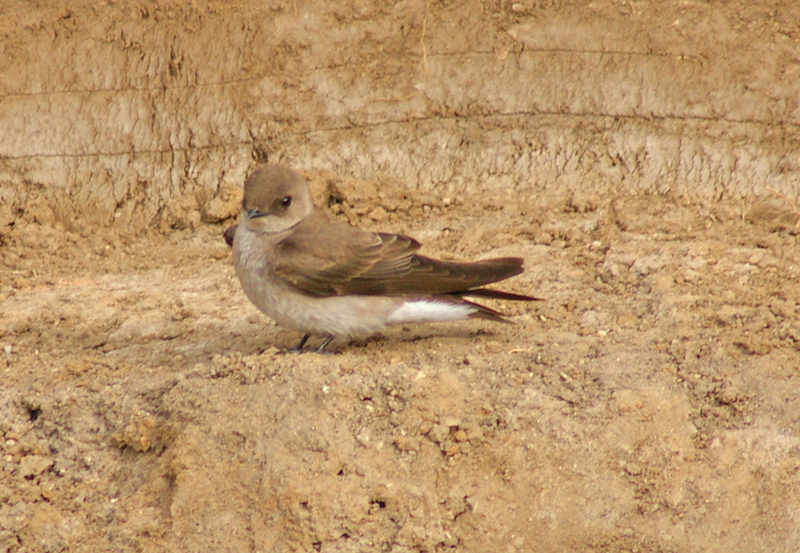 Northern Rough-winged Swallow (Stelgidopteryx serripennis). 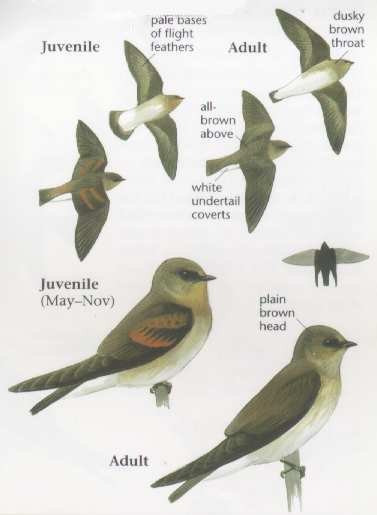 In The Birds of North America, No. 234 (A. Poole and F. Gill, eds.). 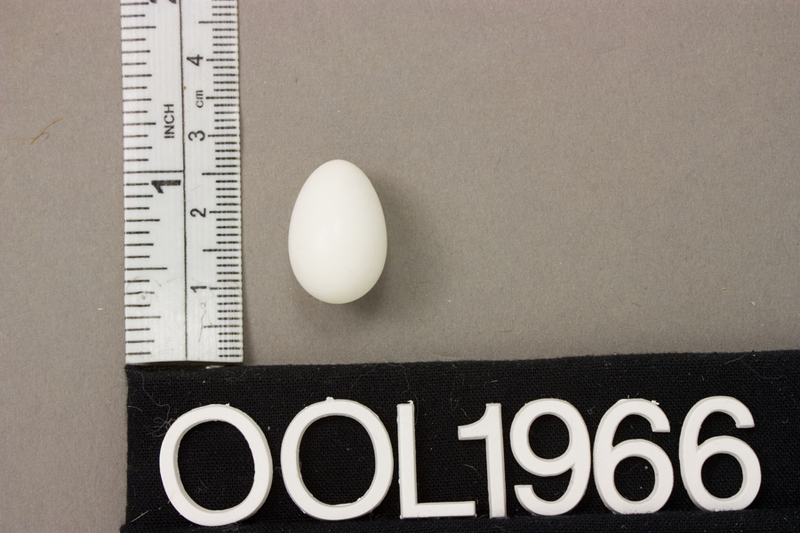 The Academy of Natural Sciences, Philadelphia, and The American Ornithologists' Union, Washington, D.C.